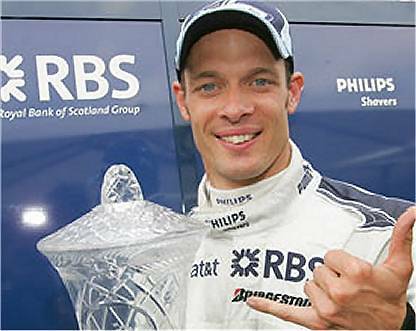 One driver that I have always had a lot of time for is Alex Wurz. He has never been a potential world champion, it's true, but the guy is competent, honest and gives his best for his team; he's what the Brits would once have called a "thoroughly decent chap". Today F1-Live has a brief article on Alex's admission that his drive at Williams is being eyed by other drivers. In typical Alex style, he insists that he's not worried, but it must be admitted that the drivers with money especially are bound to appeal to Williams to some extent. Wurz has had his problems this year, chief amongst them being difficulty in qualifying as well as he races, but he seems to be over that now and the results are coming in. Already he has scored more than twice as many points as his very quick team mate, Nico Rosberg. Of course, Rosberg has had some pretty bad luck that has prevented him from taking the points he deserves, but we should not forget that a driver's luck is just as much a part of his value as sheer speed. We can argue against there being any such thing as luck but there is no denying that some drivers seem to have all the good fortune going whilst others suffer DNF after DNF. And this year Nico is the one with "Chris Amon Syndrome". So Alex has luck going for him, at least. It could even be mentioned that his big points hauls have come in unusually chaotic races where finishing became a lottery - but taking the opportunity when it appears counts as well. What it amounts to is a nice guy winning, for a change. And that is rare enough that I cannot help hoping that he retains his seat for next year and continues to give such good value both on and off the track. I never used to appreciate Alex Wurz very much in the first stint of his career, but now I understand why Frank Williams was still enthusiastic about him. Few drivers on the grid manage to be charming, determined and reliable. If only he'd kept out of trouble a little more and been a little faster in qualifying (the latter is altering though...), he'd be ideal. Frank must be smiling.